If there’s one thing that Devil May Cry 5 proves it’s that this series has been gone for far too long! As much as we enjoyed Ninja Theory’s DMC: Devil May Cry reboot, it just wasn’t the same without a silver haired Dante hacking, slashing and shooting his way through hordes of demons. More than a decade after the last proper Devil May Cry game, director Hideaki Itsuno is back with what might just be his finest work yet. Indeed, Devil May Cry 5 may have overtaken Bayonetta 2 and Devil May Cry 3 as the best hack-and-slash action game ever made. It’s not an exaggeration to say that Devil May Cry 5 will leave you breathless, shaking and covered in sweat. You’ll shriek with elation when you best one of those customary screen-filling monsters, only to slam down your controller in rage when you die at the hands of a far less imposing demon you underestimated. Only Bloodborne and Dark Souls come close to matching the satisfaction you’ll feel when overcoming seemingly insurmountable odds. But unlike Dark Souls’ comparatively cautious approach to action, Devil May Cry 5 is about as fast-paced, frantic and in-your-face as it gets. It’s the most varied and versatile game in the series so far, featuring endless amounts of combos, weapons and special moves. A lot of this variation also comes from the fact that in Devil May Cry 5 you actually get to play as three different characters. 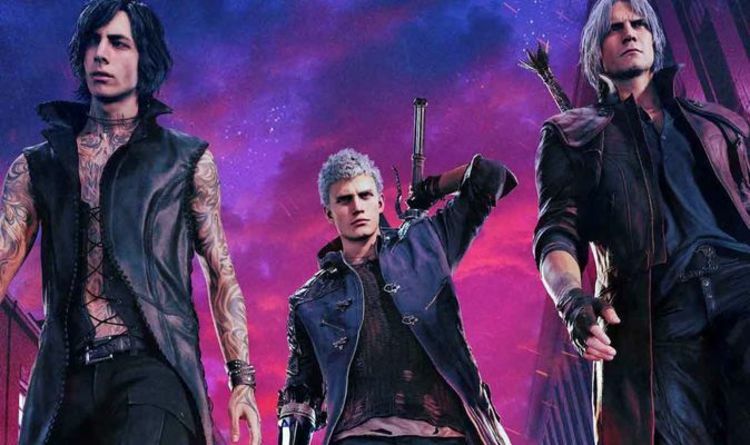 Following on from the events of Devil May Cry 4, players will take control of Dante and Nero, as well as a brand new character named V.
One of the most pleasantly surprising things about Devil May Cry 5 is how different each character plays. Nero is equipped with a variety of robotic arms called Devil Breakers. These mechanical marvels let you freeze enemies, fire missiles and even grab demons from afar. V, on the other hand, comes equipped with a cane, three demonic familiars and a book of William Blake poetry. Needless to say, we didn’t see that coming! He’s not the most nimble fighter, he isn’t a great swordsman and he can’t take much in the way of punishment, but he’s certainly the most unique. Once you get used to fighting from afar, the levels involving V provide a nice change of pace. Then, of course, there’s Dante, who plays like the Dante we all know and love, only this time he’s got a motorbike that doubles up as a buzzsaw! If that doesn’t make you want to play Devil May Cry 5, then we don’t know what will. Devil May Cry 5 is a game that revels in its silliness, and can’t help but put a smile on players’ faces. Yes, there are still one or two camera issues – these types of games always have them – and the inclusion of microtransactions does seem like an odd fit. Fortunately, however, the camera isn’t anywhere near as big a problem as it used to be, and the rate in which you unlock things feels fair. Devil May Cry 5 is Capcom’s second game of the year contender of 2019 and we’re only in March. And with the free survival-based Bloody Palace mode launching in April, Devil May Cry 5 will continue to get even better.